This is Queen Mariana, sculpted in 2004 by Manolo Valdés, the well-known Spanish artist who lives in New York. 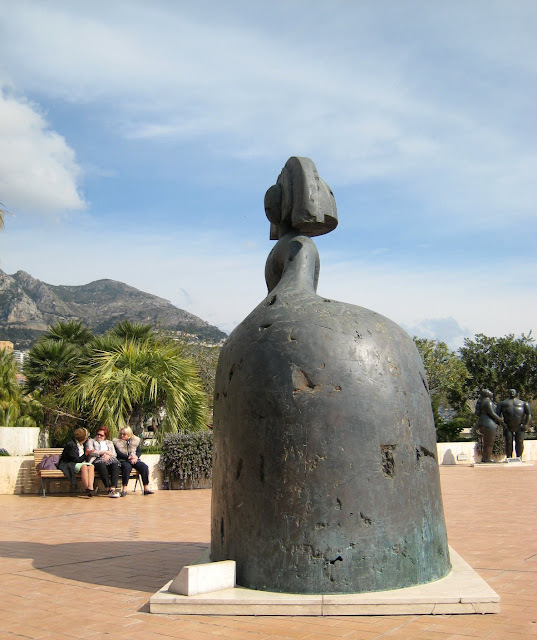 You can glimpse, in the background, Botero's Adam and Eve, which we'll visit another day. These beautiful statues are in the gardens at the back of the Casino. Who, pray, is Queen Mariana? One assumes she died from the weight of her bustle. I rather like the three ladies on the seat! Stunning background and beautifully framed photo Jilly. It reminds me of an exhibit of "Las Menidas" les Ménines at the Botanical Garden in Phoenix (AZ) in Feb. 2006 and it was really something neat. Can you imagine about 18 of them scattered in the middle of huge cactuses? Really like this piece....will watch for the Botero post! Beautiful blog of a magnificent place. Thank you, Jilly.